My husband has an extremely flexible job that allows for him to be home for the majority of our children’s big events and allows our family the ability to travel together throughout the year. He is the breadwinner of our home and works hard to provide for us. For all of this, I’m so thankful! However, with this amazing job also comes a decent amount of travel. Every couple of weeks he may be gone for a night or two on a work trip. I grew up with my father traveling for months at a time, so my husband missing out on a handful of nights a month isn’t a big deal to me from the perspective of him missing out on family time. I know that he’s home majority of the time and is playing an active, hands on role in our children’s’ lives. Those days away though? Can be TOUGH on Mama. I know that my “solo parenting time” is nothing in comparison to the single moms out there who do it daily. Or the military wives who do it for long lengths of time while simultaneously worrying about the safety of their husbands. I am in no way saying what I deal with those few nights a month is even close to what these ladies deal with (and my solo parenting times make me have an even deeper appreciation for those mamas!) but they are still times that aren’t the “norm” for me and are often tough to get through. I’m used to my husband being home. Being hands on. Being my partner in all areas and aspects of parenting and household managing. It’s my norm. And when he travels that norm is disrupted. We have four children and our oldest is almost nine. My husband has been traveling for work since before our oldest was even born, yet it has taken me years to finally have a solid system down. I’ve come to be well-adjusted to the times of travel and have even come to enjoy them on a level too! Absence makes the heart grow fonder, right? Sometimes we all need a break and breather! Feeling safe is crucial. A big part of my issues when my husband would travel were that I didn’t feel safe. I know my husband will protect our family in the unlikely event of an intruder situation. I always felt scared that an intruder would break in while he was away and that I wouldn’t be able to protect my babies or myself. We invested in am awesome alarm system that I set each night. We have a small dog that barks like crazy. I have a gun (in a safe!) by the bed. I keep lights on. I do all of the tips and tricks to help keep intruders disinterested in our home. Putting all of those safety precautions in place has allowed ME to feel safer when he’s away! A big thing when my husband is away is that I don’t sleep as well. I think it’s just missing him beside me plus that combined fear issue that causes me not to sleep as deeply as I normally would when he’s home. Rest is crucial. 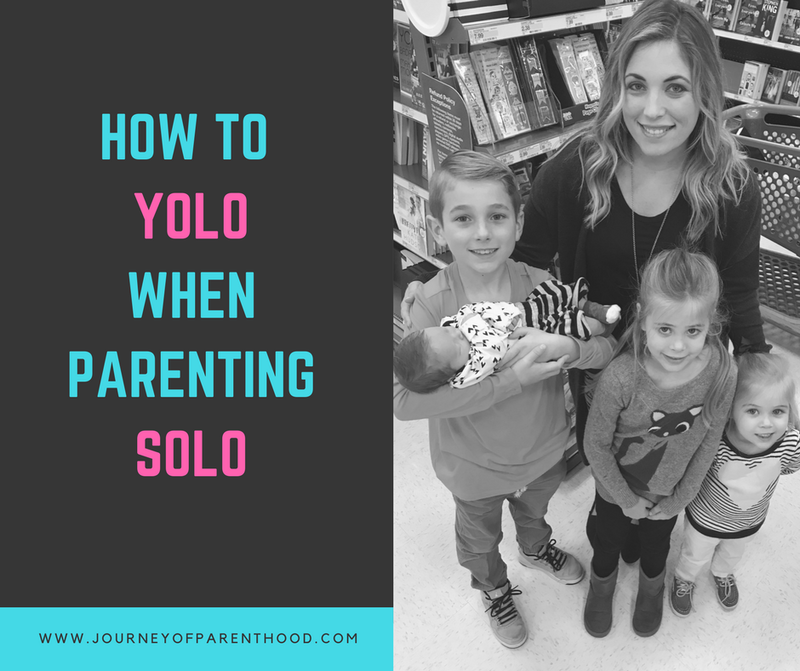 It allows us to function at our best and you have to be on your a-game when you’re solo parenting! Make sure to keep the kids on their schedules. And keep yourself on one too! I’ll admit that it’s EASY to binge watch a favorite show or get caught up browsing social media when my husband is away. Our evenings are usually our together time and when he’s gone I get a big extra dose of ME time and what mother doesn’t long for more of that? It’s EASY to glance at the clock and realize it’s 1 AM. I have to put a conscious effort into going to bed early so I’m able to get the full rest I need. Planning ahead is so important. I know when my husband is gone that certain tasks are harder to accomplish. I plan for those and try to knock things out in advance when possible. I am my best self when my kitchen is clean so I will give that area a good cleaning before he leaves. I like to make sure I have easy to cook meals for myself and the kids planned out. I arrange their bath nights to minimize the evenings where they need baths while he’s gone (bath duty usually belongs to him!). Figure out what areas will be the toughest without his help and knock them out together before he hits the road! Children thrive best on routine…and so do adults. We are “schedule people” so I make sure to keep my kids on their regular schedules as much as possible when Daddy is away. I make sure they keep their bedtimes and nap times and meal times pretty close to the normal times. By keeping the kids on their regular schedules, they are less likely to have an negative reactions to their dad being away. Of course they miss him and it can be hard not having him there, but it can also just be “business as usual” when their daily routine stays in tack. Maintaining as much communication as possible with your husband while he’s away will ensure a smoother transition when he gets back home. I have the kids call him to fill him in on news (“I lost my tooth!” or “I got an A on that test!”) and try to FaceTime as much as we can in the evenings. Throughout the day we make sure to text often and keep each other in the loop on everything we’re each experiencing. Absence can make the heart grow fonder and sharing that you miss each other can make that reuniting time even more special. However, absence can also easily create distance. It’s easy to get in a new routine that doesn’t include your husband and that can make it tougher when he comes back home. By trying to keep a constant flow of communication it makes it feel like he’s not really so far away at all! All of these things have helped me to personally survive while my husband is away. But the thing that took me from survival to thriving? When I decided to “YOLO” when I’m solo. I realized that so often the job of “mom” means the “boring parent.” I’m the one that keeps us on our schedule. I’m the one that reminds to get things done. Pushes the chores. The homework. The healthy eating. When my husband is away? That’s a PRIME TIME to let my fun side SHINE. Rather than get frazzled while he’s gone. Rather than feeling over-worked with my plate over-filled and my patience level at a minimum…I try to let it all GO and just ENJOY! While it’s a huge blessing to have a husband who is so hands on and involved in all aspects of our kids’ lives…it also means our kids are pretty much always around both parents. They are used to my husband and I talking to each other about “adult things” while they sit there listening. They are used to sharing their time and attention with us both. Hearing both of our opinions on things. Getting both of our feedbacks. Having both of us discipline. Both of us weigh in on everything. When my husband is away it’s a great chance for my children to connect with me. Get to know who I am as a person. It’s a great time to let loose a bit and show them my fun side. My silly side. My go with the flow abilities. They can get my individual perspective on things and an opportunity for one on one time with just me! An outing: I take all of the kids somewhere. Anywhere. Even just to Publix or Target. Anytime you go somewhere with four small kids and have it be a success it just feels like a HUGE WIN and you instantly feel so great about yourself! Treats for dinner: Speaking of dinner…my very first “yolo when solo” idea actually came about when I had a craving for ice cream and decided we’d all just go get some ice cream for dinner that night. My kids thought I was both crazy and super awesome and it was a fun memory we’ll never forget! Movie night in bed: We don’t co-sleep so the kids aren’t used to spending time in Mommy’s bed but curling up all together to watch a movie before bed is SO fun and something they LOVE doing! Individual Time: Something we’ve started doing is solo Mommy time where I have a set amount of time to spend with each child doing whatever they’d like to do. If my husband is gone for several nights we’ll do one kid each night. If it’s just for one night we will do 20-30 min each child. This is not only fun, but it allows me to learn so much about each child! What they enjoy and how they best connect. It’s never easy parenting alone. It’s hard when your husband is away. The kids miss him. I miss him. Our natural routine is thrown a bit off balance. But I firmly believe by feeling safe, planning ahead, getting good sleep, maintaining routine, keeping in touch and having some yolo thrown in that a tough time period where I’d normally struggle can be one where I truly thrive! Emily loves bargain hunting, is passionate about keepin’ it real, and considers Disney World her happy place. 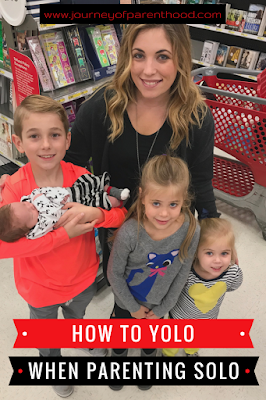 She’s the mother of four (Kye, Britt, Tess and Spear) and blogs at The Journey of Parenthood.